Arizona students can choose from a wealth of nationally ranked online colleges in the state. The Georgetown Center on Education and the Workforce projects 68% of jobs in Arizona will require postsecondary education by 2020, especially within the state’s booming IT and healthcare industries in administrative and sales positions. Whether located in or out of state, students need help finding the right program online in Arizona to meet their career needs. 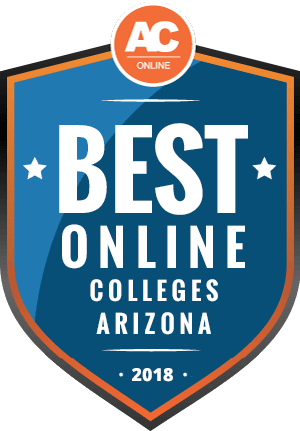 The following ranking of the most affordable online colleges in Arizona provides definitive answers to questions about transfer credits, financial aid, and enrollment dates and deadlines. Online programs in Arizona cater to an increasingly diverse student body. As reported by IPEDS, as of 2016 Arizona offers 44 completely online higher education programs, counting more than 25,000 undergrads and 10,000 graduate students among those enrolled exclusively online. Additionally, nearly 300 international students chose to pursue an online program in Arizona. Among the benefits of learning at a distance, the depth and breadth of online programs in Arizona serve growing demographic groups including single parents, workers in shrinking traditional labor industries, full-time workers, and underserved populations. Generally, tuition for in-state students is more affordable than for non-residents. For online students, the cost of tuition depends on whether a school differentiates between in- and out-of-state rates, or offers a flat rate for online learning. To qualify for in-state tuition rates, most Arizona schools require proof of residency for 12 months prior to enrollment. Additionally, out-of-state students in some neighboring states may qualify for reduced tuition rates due to reciprocity agreements with Arizona colleges. As shown below, students residing in the state of Arizona can save between $5,000 and $15,000 on tuition at two- and four-year institutions, respectively. While Arizona ranks 37th among the 50 states for college tuition rates compared to the national average, the state ranks fourth in the nation for low debt at the time of graduation. Students living out of state and pursuing an online program in Arizona should consider several factors when choosing a school. Among the key considerations, a student should explore whether the school qualifies for reciprocity or good-neighbor discounts with the student’s state of residence. Students must also make sure their state does not restrict enrollment in an online program in Arizona, as per some state agreements. As shown below, IPEDS reported a combined total of nearly 21,000 undergraduate and graduate students enrolled in exclusively online programs in the state. Nonresident students in Arizona may receive tuition breaks if they live in a neighboring state that meets interstate compact qualifications. As one of 16 members of the Western Interstate Commission for for Higher Education (WICHE), Arizona offers student-exchange programs and cost-saving initiatives to students who live in neighboring qualifying states. Specifically, the Western Undergraduate Exchange (WUE) under WICHE can help nonresident students save as much as $9,000 on tuition each year, provided they attend an approved school in a state within the Western compact. The National Council for State Authorization Reciprocity Agreements (SARA) ensures that select institutions within each regional compact provide high-quality distance education and uphold state reciprocity. To qualify for SARA approval, accredited institutions in Arizona must submit an application and pay a state fee, depending on how many students each school enrolls. Students ultimately want to attend the very best online colleges in Arizona, though conducting their own research can be overwhelming. To form our list, we considered several key factors that contribute to the top online schools in Arizona, emphasizing quality, affordability, and accessibility for distance learners. Read on to explore our comprehensive research guide and find the right online programs in Arizona to suit your educational and career goals. While a student’s quest to find the right online college in Arizona is multi-faceted, our FAQ resource roundup provides answers to the most common questions, all in one place. Read on to learn more. Do online credits cost more or less in Arizona? Generally, tuition for online programs costs more than those offered on campus, at in-state rates. While schools in Arizona offer a wide variety of online programs and support the continued expansion of online education, for-profit public state universities must always consider their bottom lines when it comes to tuition costs. For example, at Arizona State University (ASU), an Arizona resident completing an undergraduate degree at the downtown Phoenix campus pays $5,711 per semester; however an online nonresident student enrolled in the same program must pay $6,339 per semester. Costs per credit vary according to how many course credits a student takes per semester. Students in the WUE program may pursue a bachelor’s in social work through ASU’s College of Public Service and Community Solutions, at a rate of $8,059 per semester. At other participating WUE-qualified online schools in Arizona, students pay no more than 150% of in-state tuition costs for approved online programs. Which Arizona schools accept the most transfer credits? Large public institutions like Arizona State University and University of Arizona tend to adopt the most generous credit-transfer policies, especially for undergraduate applicants. ASU accepts up to 64 semester hours of transfer credits, provided the student earned the credits from a regionally accredited school, with a grade of “C” or above. The University of Arizona does not specify its overall maximum for transfer credits, but allows a student to transfer up to six general electives and up to three physical education courses for which the student earned at least a “C” grade from a regionally accredited school. Beginning in Spring 2019, students may apply credits for prior learning from nationally or regionally accredited institutions. Northern Arizona University (NAU) also accepts a high number of transfer credits and alternative course credits earned through the American Council on Education. NAU applicants may apply up to 64 college-level transfer credits provided students received a minimum grade of “C,” “P,” or 2.0. Students must receive approval from their individual program to apply more than 64 transfer credits. NAU applies transfer credits at face value, per a one-to-one ratio, matching all course credits on a credit-unit-for-credit-unit basis. Will any online colleges in Arizona accept a GED? The majority of online colleges in Arizona grant admission to applicants holding a high school diploma or GED. Many four-year public universities including ASU, NAU, and the University of Arizona simply require that the student provide all high school transcripts with their application. Some individual programs require that students meet additional core prerequisites but will still accept a GED as the minimum education requirement. Private online colleges in Arizona like Grand Canyon University (GCU) also grant admission based on a holistic assessment of the applicant, accepting a GED or high school diploma for consideration for undergraduate programs. How many academic terms per year do online colleges in Arizona offer? Most online programs in Arizona offer multiple start dates, among the many perks of enrolling in a distance degree. While not all online schools in Arizona offer weekly start dates, online programs tend to follow a much more flexible schedule than traditional programs, with frequent points of entry throughout the year. ASU students earning a degree online can start at one of six entry dates per year, which works out to two per each fall, spring, and summer semester. Similarly, the University of Arizona offers online start dates every seven and a half weeks. NAU stands out among online colleges in Arizona for offering weekly start dates for its online programs. Which online colleges will accept FAFSA in Arizona? Whether applying for a traditional or online program in Arizona, one should always plan to complete the FAFSA as a first step toward pursuing financial aid. Like an on-campus program, most online schools require the FAFSA as follow-up to an admissions application to determine a student’s eligibility for federal, state, and institutional aid. Online schools in Arizona including ASU, NAU, the University of Arizona, the University of Phoenix, and GCU direct students toward filling out the FAFSA on their path toward finding qualifying financial aid to help pay for their degree. Each college provides its own unique school code, to be entered as an identifier during the process of filling out the FAFSA either on paper or online. Are there any free online classes I can take from Arizona colleges? Many Arizona colleges, especially the most populous public universities like ASU and the University of Arizona, offer students access to massive open online courses (MOOCs) through a aggregate website such as Class Central. Students can search by subject and start date, browsing free supplemental courses in majors spanning art history, English, and computer coding. Students actually complete the courses through an open-course learning platform like Coursera. Learners can also browse MOOC sites directly instead of through the school’s page to explore a broader set of options. Popular directories include Coursera, edX, and The Open University on iTunes. How can I find the online program options at Arizona colleges? With enrollment in online colleges in Arizona and across the nation increasing, most schools develop their own department or division exclusively for distance learning. For example, the University of Arizona hosts UA Online, exclusively for existing and aspiring distance students. Here, students can learn about programs offered, how to apply, and how to complete their coursework online. Similarly, other prominent schools offer subsites for their online divisions in the form of ASU Online and NAU Online, while colleges like GCU simply offer an interactive tool that allows students to filter online degrees and programs. Some online schools also require entirely separate admissions and/or program requirements. Students should always check their school’s individual online page or subsite for details about enrolling in its online programs. While each student qualifies for unique financial aid opportunities, many college applicants explore Pell Grants before other options. The first course of action for low-income students seeking need-based aid, Pell Grants do not need to be repaid and can be adjusted to a broad range of student incomes and study plans. Students who do not qualify for select forms of federal aid or are seeking an advanced degree should explore additional scholarships in Arizona. The brief list below includes some of the most popular scholarships in the state. Sponsored by Arizona City/Council Management Association, this scholarship is awarded to undergraduate and graduate students majoring in public administration or public policy who aspire to a career in local government management. Applicants must be full-time students at one of four qualifying Arizona universities. The scholarship encompasses a monetary award and a paid internship opportunity. Arizona City/Council Management Association sponsors this award for graduate students aspiring to a career in local government management. Applicants must enroll in a graduate program in public administration in one of four qualifying Arizona schools. Students must complete a minimum of nine course credits by December of the year in which they apply. The Phoenix chapter of Project Management Institute Educational Foundation awards this scholarship to undergraduate, graduate, and doctoral candidates studying project management or a related field. Applicants must hold residency in the state of Arizona. Andeavor Companies, Inc. awards this scholarship to students in one of 18 states under Andeavor’s business jurisdiction, including Arizona. Applicants must hold permanent residency in Arizona, possess a minimum GPA of 3.0, and demonstrate documented financial need to qualify. Sponsored by Medical Group Management Association, this scholarship supports students in western states including Arizona, studying medical practice management or a related field. Applicants must meet state residency requirements and may pursue an undergraduate or graduate program.